According to industry analysts, BioShock Infinite is on track to sell 4.5 million units in its first year of release. Financial services group Cowen & Company has revealed that BioShock Infinite sold 878,000 units during its month of release. Not only was it the top-selling game for March in the United States, but considering Infinite was released on March 26, that means those numbers came from its first week on the market. That's not too shabby, and publisher 2K Games agrees. According to analyst Doug Creutz, this is "a few hundred thousand" units above company expectations. 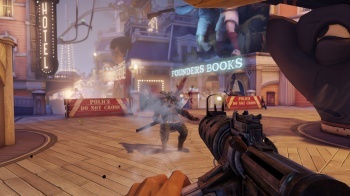 BioShock Infinite's sales were helped by overwhelmingly positive reviews, and the analyst predicted that it would continue to have a strong year. Irrational Games' follow-up to the 2007 hit BioShock is expected to sell 4.5 million copies during its first year on the market. This is obviously great news for Irrational and 2K, and it's really refreshing to see such realistic sales expectations. Comparatively, the Tomb Raider reboot had the best launch in the series' long-running history, selling 3.4 million copies in its first month. This was somehow disappointing to publisher Square Enix, which announced that Lara Croft's latest adventure failed to meet expectations. Infinite was one of 14 games that sold over 100,000 units in March, making it one of the strongest months for the video game industry in years.